Unfortunately, we now return to your regularly scheduled amateur photography by me. After an excursion to Smith’s on Capitol Hill, James was inspired to make orgeat syrup using this Serious Eats recipe. It is often the case for me, too, that I will be moved to recreate a drink after ordering it at a bar or a restaurant. The drink on the menu at Smith’s was called a Trinidad Sour, and when I heard the name I thought perhaps James had stumbled onto this Trinidad Sour that made a splash a few years ago by using Angostura as a base spirit. And indeed, the drink at Smith’s seems is very similar to the one that I remembered, except it uses Fernet instead of Angostura for its bitter component. Mint and orgeat go very well together, as we know from the Mai Tai, so it is a reasonable and interesting substitution, though it required very different proportions. Shake over ice and double-strain into a cocktail glass. Gently float a lemon wheel on top. The home-made orgeat was very milky, and had a much nuttier flavor than the Monin Orgeat that I have been using lately. The Monin has the marzipan/almond extract flavor that you expect in an orgeat syrup, but it does not actually taste all that much like an almond. The home-made syrup, on the other hand, was more reminiscent of sweet almond milk, and the orange flower water was very discernible, and pleasant. 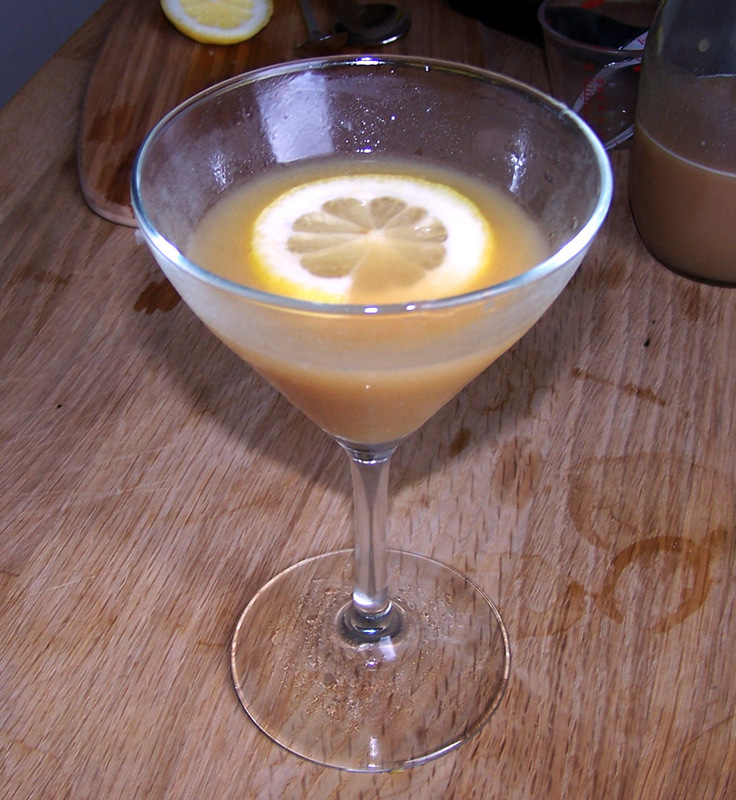 As you can see from the photo, it gave this drink a creamy color and texture. If you’re on the fence about fernet, this is probably a great drink to aid you on your journey. Shake and double-strain into a coupe glass. I had thought this drink would be less accessible than the Fernet version, but I was wrong. The Angostura Trinidad Sour is sweet and spicy, and it tastes like cinnamon, clove, and cherry wood. Equal parts of syrup and bitters cuts all of the challenge away from the Angostura, and gives the drink a cotton candy quality that I don’t mind, but that I don’t crave. I suspect I would prefer it with only an ounce of syrup, and I will be trying that variation soon. 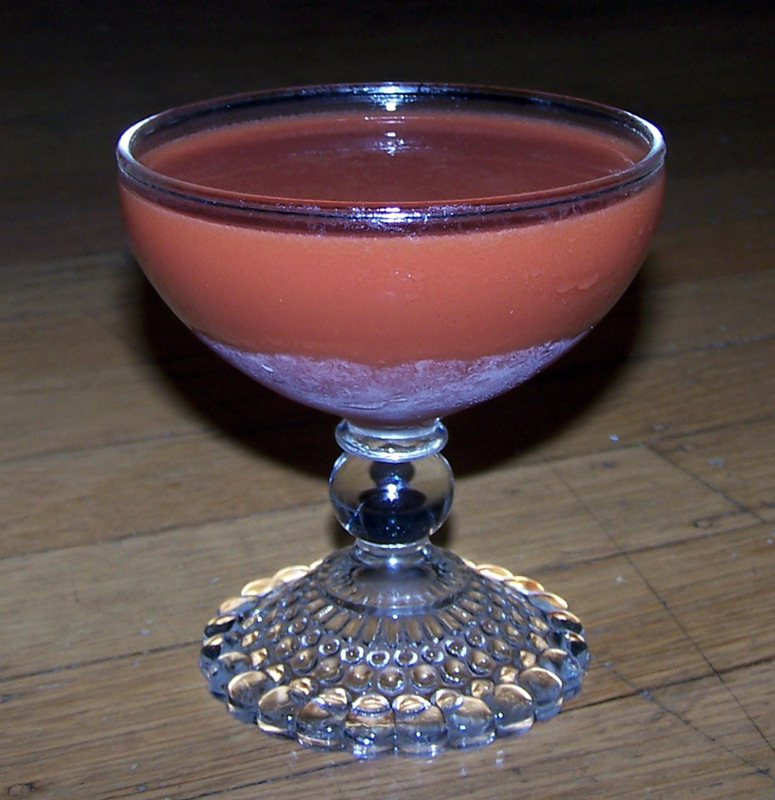 I adore the color of the Angostura bitters version, however; Angostura has an oily, staining red color to it, and with the cloudiness from the orgeat, it has a distinctive and striking appearance. Even so, if you only make one of these, I suggest the Fernet version, but both are excellent. Categories: modern drinks, tiki | Tags: almond, almond syrup, booze, cocktail, drinks, fernet, fernet branca, lemon juice, mixed drinks, orange flower water, orgeat, rum, sour | Permalink.